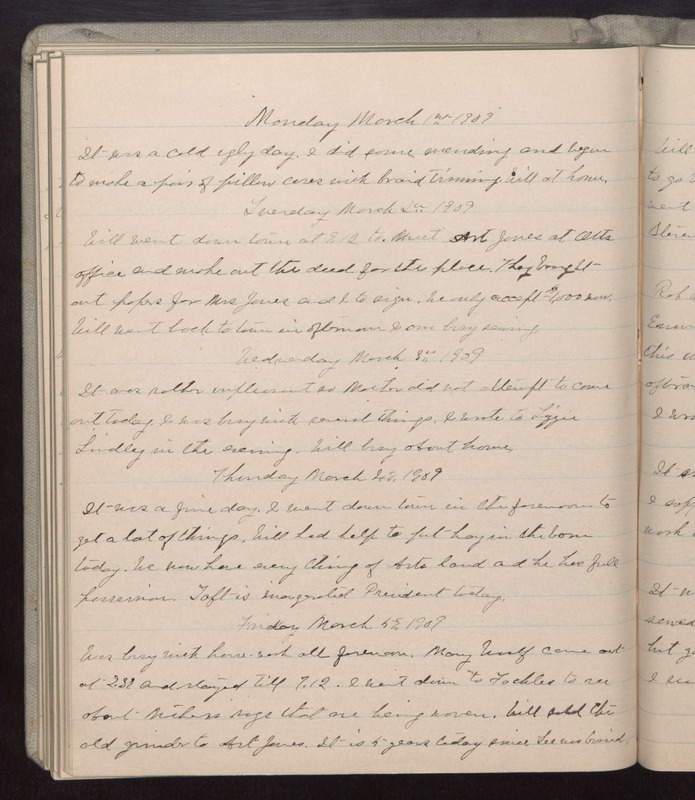 Monday March 1st 1909 It was a cold ugly day. I did some mending and begun to make a pair of pillow cases with braid trimming. Will at home. Tuesday March 2 1909 Will went down town at 9.12 to meet Art Jones at Otts office and make out the deed for the place. They brought out papers for Mrs Jones and I to sign. We only accept $1,000 now. Will went back to town in afternoon I am busy sewing. Wednesday March 3 1909 It was rather unpleasant so Mother did not attempt to come out today. I was busy with several things. I wrote to Lizzie Lindley in the evening. Will busy about house. Thursday March 4 1909 It was a fine day. I went down town in the forenoon to get a lot of things. Will had help to put hay in the barn today. We how have every thing of Arts land and he has full possession. Taft is inaugurated President today. Friday March 5 1909 Was busy with house-work all forenoon. Mary Woolf came out at 2.32 and stayed till 7.12. I went down to [illegible] to see about [illegible] rags that are being woven. Will sold the old grinder to Art Jones. It is 5 years today since Lee was buried.